Video game ratings are important for a lot of players. Just ask NBA player, Donovan Mitchell, who campaigned for a higher dunk rating in NBA 2K18. Some NFL players, such as Mike Evans, make it their goal for the season to improve their Madden rating. These ratings mean as much to players as they do to fans. While NHL 18 may be the worst hockey game I have played in years: the mechanics became too complex; there is an unbalanced difficulty system; and repeated presentation from previous years (NBC covering AHL and ECHL? Really?). However, the game is still fun and the ratings are crucial for developing your favorite team into a Stanley Cup contender. Without further ado, let’s take a look at the most recent ratings (as of February 28) for the Minnesota Wild. The first line features Jason Zucker (82 overall), Eric Staal (85), and Mikael Granlund (85.) The two former players are both slated as top six forwards, while Granlund is listed as elite potential. Zucker is very underrated in this game; EA has him listed as Speed (87), Acceleration (87), and Wrist Shot Accuracy (86). During gameplay, it is not easy to break open with him which is far from the real player. Zucker’s strength in the NHL is blazing speed and when he shoots he usually finds that open spot and exposes the goaltender. He isn’t a 90-overall by any means but something more on par with his fellow linemates makes sense. Mikko Koivu (84), Zach Parise (83), and Charlie Coyle (83) comprise the second line. All three are again listed as top six forwards. I find it very surprising that Parise and Coyle have a combined 12 goals and 26 assists on the season, while Zucker has 26 goals and 25 assists alone yet is somehow ranked lower than both players. Koivu is also rated only one speed lower than Zucker (86) and his faceoff rating is only (85). EA has clearly dropped the ball with Koivu’s stats. On a positive note, Coyle does deserve a rating boost for Durability (85) after taking a puck to the face during Thursday’s loss to the Arizona Coyotes. The third line groups together three more top six forwards in Nino Niederreiter (84), Joel Eriksson Ek (77), and Tyler Ennis (78.) Niederreiter has very accurate numbers with his shooting statistics at (88) to pair along with strong Speed (88) and Puck Control (88). Ennis has played very poorly all season for the Wild so seeing him ranked so high is a disappointment. Everything in the categories of Puck Skills, Shooting, Skating, and Senses is an 80 overall or better with the exception of Balance (79). It would be great for Minnesota if Ennis was as talented as he is in NHL 18. The top nine forwards on the fourth line are Daniel Winnik (79), Matt Cullen (76), and Marcus Foligno (77). All three skaters are accurately rated. While playing the game, the line is good at checking and offers minimal scoring. EA did a surprisingly good job with the fourth line after the major blunders with the first two lines. The Wild’s first pair includes Ryan Suter (89) and Matt Dumba (83). Suter is given elite potential while Dumba possesses top-four defenseman potential. It is hard to complain about Suter’s rating for Passing (90), Puck Control (90), Slap Shot Power (89), Defensive Awareness (93) and Shot Blocking (90). My biggest issue is the 88 overall speed. With EA figuring that Suter is faster than Zucker, you have to wonder if they watch hockey or are guessing. Dumba looks pretty good compared to his play in real life. His offensive abilities surpass his defensive ratings across the board. Minnesota’s second defensive pairing includes Jonas Brodin (82) and Jared Spurgeon (84). 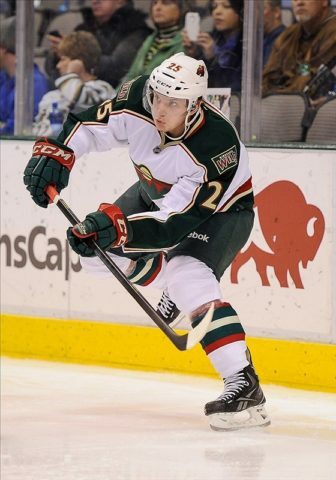 Brodin has elite potential while Spurgeon figures as a top-four defenseman. Spurgeon is a good shooter with smarts on defense in real life and the game reflects that. Brodin is critically underrated. His shooting is spot on with Slap Shot Accuracy (77) and Wrist Shot Accuracy (79). However, his defensive ratings were very poorly constructed. Brodin was given Defensive Awareness (87), Shot Blocking (86), and Stick Checking (85). In his return to action against the St. Louis Blues last week, he posted four blocked shots alone. His defensive ratings are in dire need of a boost. The third pairing for the Wild looks solid with Nate Prosser (76) and Nick Seeler (70). Prosser is listed as seventh defenseman potential and Seeler is an AHL top two defenseman. EA nailed Prosser, in-game he does everything you need from your d-man but nothing more. It’s a little early to make the call on Seeler, who has only played in ten career NHL games. Devan Dubnyk is Minnesota’s starter with an 87 overall. He has elite potential and the game does a good job of accurately projecting his real-life play. His only stat below 85 overall is Puck Playing Freq. (83). Alex Stalock is listed as a 79 overall with fringe starter potential. He is listed as mid-to-low 80 overall in nearly every stat. What makes him an effective backup in NHL 18 is his Speed (86) and Agility (86). While Stalock lets a significant amount of pucks in the net compared to Dubnyk, he is fairly quick and has decent reaction speed. Overall, looking at the overall stats, the game is fairly accurate. Once you get to the individual stats and do some comparisons, that’s when you begin to run into trouble. Zucker is on pace to surpass 30 goals this season and the game has him ranked below Parise, Coyle, and only four ratings better than Ennis. The inconsistencies with his speed need to be addressed in an update if they want to do him justice. Defensively, the team looks great and has a very strong top-two defensive pairings. The defense in real life has put up 30 goals between Suter, Dumba, Brodin, and Spurgeon. EA did a good job of allowing the Wild’s defensemen to jump in the play and score in their video game just as they do in the NHL. The goaltending situation might not sit well with everyone. 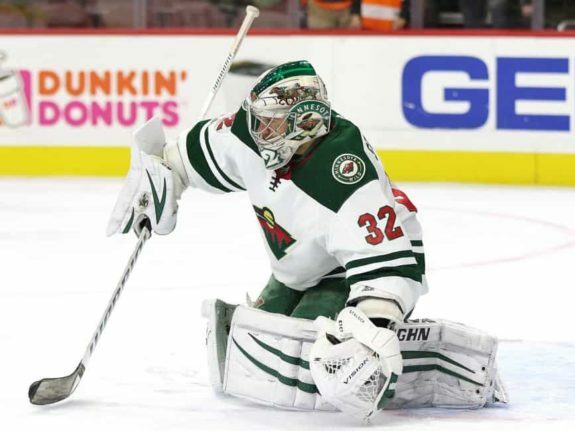 While Dubnyk has bad games, he has been a very effective goaltender for the Wild. I believe both goalie ratings are justified and that EA again did a good job in this regard.